Annan Athletic’s chances of making the play off’s were given a severe jolt after they were comprehensively defeated against East Fife on Saturday. It was a match where Annan could have cemented their position in the play offs but it turned out to be a day they will want to forget very quickly against a determined Shire team who are already confined to the play off places in an effort to sustain their league status. The Annan team showed one change from the side which defeated Arbroath the previous week with Steven Sloan being relegated to the bench, his place being taken by Rabin Omar. The Shire started very promisingly and Annan were forced to defend deep in order to contain the lively Shire attack. Lewis Guy had a great opportunity to put Annan ahead in the 9th minute when he latched on to a Jago pass but Darren Dolan in the Shire goal pulled off an important save as the Annan striker homed in on goal. Dolan then pulled off another save to deny Guy who was set up by Weatherson in the 14th minute. Max Wright opened the scoring for the visitors in the 20th minute with a superb strike from the edge of the box when he collected a low cross swung in from the right and he finished with a low shot which beat keeper Jordan Hart all ends up. It was a real blow to Annan but minutes later they gave their fans a lift when a good move down the right between Todd and Weatherson opened up the Shire defence with Todd winning a free kick from a dangerous position out on the right. Max Wrights 28 yard free kick in the 25th minute was easily saved by Hart and in the 35th minute Barry Cuddihy ended a good surging run with a good effort which was tipped past the post by keeper Darren Dolan. East Stirling were then dealt a blow in the 39th minute when Max Wright was given a straight red card for a rash challenge on Rabin Omar. Annan finished the half on the attack when Josh Todd was fouled 25 yards out but Weatherson’s well struck free kick just failed to hit the target. Annan made a promising start to the second half when Jago’s effort from 20 yards went narrowly over the bar closely followed by a Weatherson header which went over the bar. Hart was lucky to rescue the situation in the 50th minute when he managed to clear a poor pass back as Annan almost got caught on the break closely followed by Cuddihy’s solo effort which tested keeper Dolan. Smart Osadolor was introduced in the 55th minute within 3 minutes he squared the game with a low shot from the corner of the six yard box. It was a well worked goal with Osadolor and Todd combining to unlock the Shire defence. Annan were looking good at this point and they continued to press forward in an effort to grab all the points. Annan then had claims for a penaty dismissed and in the 66th minute and minutes later Todd was denied a goal when his shot came off the post after some good work down the left by Omar. Annan looked to be in control. It only seemed a matter of time and once again it was Todd who set up an opportunity when he finished a run along the bye line with a cut back but unfortunately there was nobody at hand to connect with the opportunity. Then against the run of play Annan were dealt a blow in the 78th minute when Jago conceded a free kick just outside the box on the left and substitute Kristopher Faulds low well struck shot flashed past a ruck of players And into the corner of the net to give the Shire the lead once again. 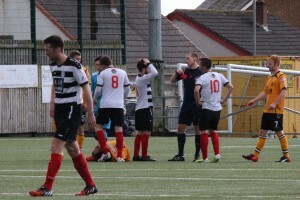 The goal appeared to knock the stuffing t out of the Annan team and minutes later they conceded once again. It was however a goal Annan will look back on as one which could have been avoided when a ball swung in from wide on the right landed between Breslin and Jago and Faulds made the best of the indecision to head the ball over the advancing Hart and into the empty net. Annan tried hard to get a foothold back in on the game but it was all to no avail and they no face an anxious end to the season with matches against Stirling this coming Saturday and what increasing looks like a decider against Queens Park in the last league game of the season.